he newest full-length release from the sissies. 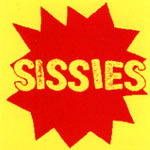 The sissies are a great diy punk band from the heart of the midwest - Indiana. They play infectious folk-influenced punk with rapid-fire female vocals. They never change their clothes and they rock harder for it. I know, I've been on the road with them.